A stainless steel fork and spoon in a convenient carrying case to keep lunch bags and diaper bags clean. 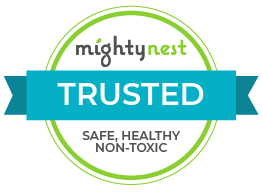 A perfect nontoxic, worry-free mealtime solution! The utensils are made with the highest quality food grade 18/10 stainless steel and the carrying case is made from BPA-free polypropylene plastic (#5). Care & Use: Wash thoroughly before first use. Spoon/fork tray is removable for thorough cleaning and recommended for travel to hold utensils in place. To prolong the life of the carrying case, handwashing is recommended. Dishwasher safe. Not for use in microwave ovens. I love ❤️ these! I keep it in my lunch bag. I also have an e tra set in my office desk drawer. I never have to go searching for utensils and I am not adding to the landfill. My daughter was very excited to have this set for her lunchbox. It's now her official utensil set for school lunches. Great quality stainless steel utensils and sturdy container to transport. I bought this for my 5 year old to put in her lunch box for school. What I didn't realize is that this is a FULL SIZE set of silverware with a case, not toddler size like I thought I was ordering. With the case, this set is longer than her bento box. It's a great quality, the case is also nice and sturdy, so I have no doubts about it holding up over time, but I feel like the packaging is misleading. I suppose it's my own fault for not seeing the size in the description, but seeing something from a brand called inno*BABY* tends to make me believe it's a product catered toward children. It's a good set, just not what we're looking for. If I had known beforehand, I would not have purchased this.